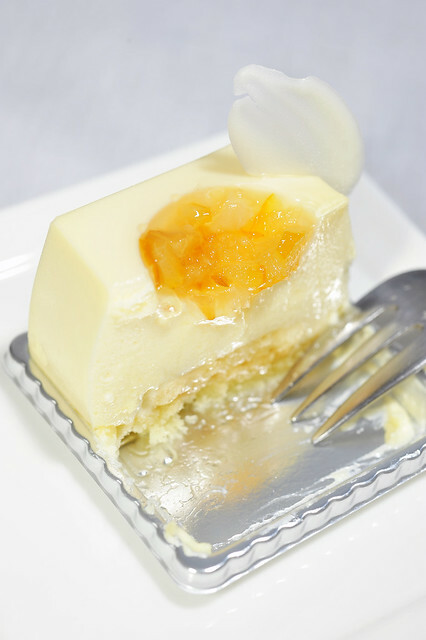 The true flavours of yuzu were also not fully explored, let alone exploited, given that only candied yuzu rind in heavy syrup, probably Korean Yuja Citron Tea was used. Not very Japanese is it? Flavours were mild, put politely. None of the overhwehelming aroma and overbearing tartness one would expect from the fruit. 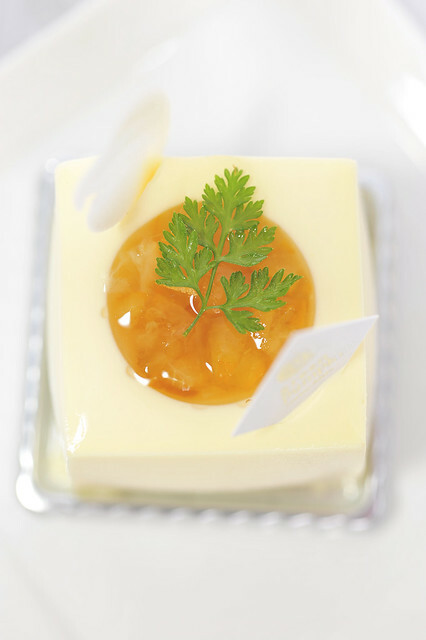 If I were to be yuzu, I’d probably cry foul and lament at the undignified sacrifice of being crafted into this. The base used a piece of sponge which had soaked up too much liquids that leached and gravitated from the components above, causing the base to disintegrate into oblivion when held up. It doesnt do very much to improve on the diversity of the textures of the cake. Its a very pretty piece I must say, with the little candied sitting in the middle like a little rind of gold. Tis just unfortunate that it doesn’t taste as fab as it looks. If you like yuja citron tea (which I do! ), you would probably like this piece. But if you’d tasted yuzu before, you would, like me, find this piece severely lacking and dissatisfying. 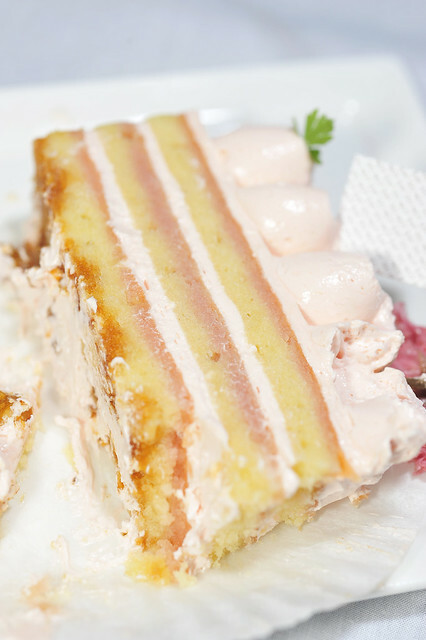 Sakura Buttercream Cake is another cake “popular” amongs food bloggers. The main criticism from everyone lies on the texture of the buttercream, which I’m afraid that I have to concur. The buttercream used, despite being only thinnly spread between layers of sponge, was overtly cloying. Then again, I’m no fan of buttercream to start with. So the cake is not to be blamed for my bias? Well, its not all bad I guess. I enjoyed the caramelised walnuts embedded within the lowest layers of the cake. It renders a slight bitterness which made the piece overall more realistic. Surrying around and nibbling on these little caramelised morsels were the only saving moments. It does look quite pretty doesn’t it? In a very girlish pastel pink. I loved the folds created on the top with a St Honore piping nozzle. The embellishment of picked sakura no hana was also a nice touch. 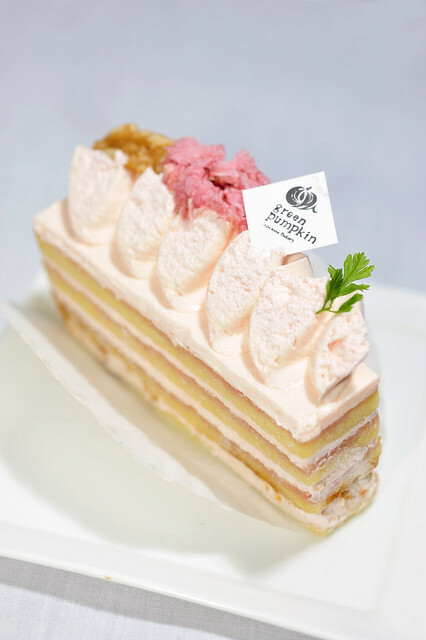 Evenly layered with alternating layers of sponge, a denser component which reminded of sakura’ an made from pickled cherry blossoms and shiro’an, as well as buttercream.Proportions wise, there’s nothing to fault, though the aesthetics is clearly not an indication of the taste. Once again, looks can be deceiving. 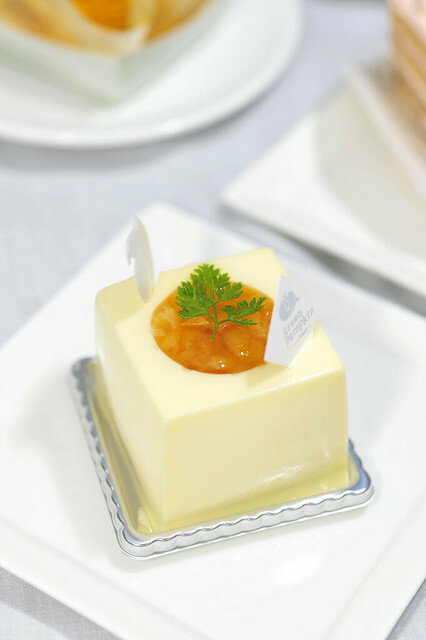 This buttercream cake does make me wonder about the construction of a similar cake which I’d been wanting to make for a long time, Hidemi Sugino’s Framboisier. It made me think harder about the components, especially the construction of the buttercream and ways to avoid being cloying and sickening sweet at the same time. I think I’d gotten the components more of less sorted out. So tis just a matter of when I guess. Alas, despite being a failure not working very well for me, the Sakura Buttercream Cake did serve a purpose after all. It reminded me of what a cake should not taste like. This entry was posted on April 9, 2012 by Alan (travellingfoodies). 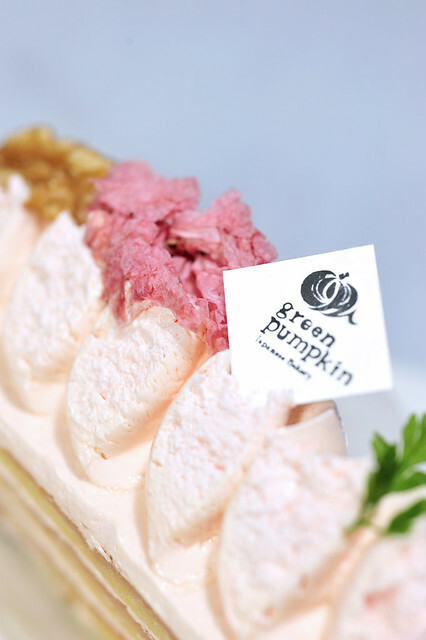 It was filed under Food and was tagged with buttercream, cherry blossoms, creamcheese, green pumpkin japanese bakery, kabocha mont blanc, nex, sakura buttercream cake, serangoon central, yuja citron tea, yuzu cheesecake. I like honest reviews, and they are always just one person’s opinion. But it gives an idea of what to expect. If you like super sweet butttercream you may be attracted to the pretty pink dessert. What is sakura no hana by the way? I also didn’t know what shiro’an was but now that I’ve looked it up I want to try using it in something! It’s intriguing. Have you ever used it in a dessert? It’s always a struggle to write bad reviews honestly… quite literally. Its so easy to say that you don’t like a piece but ever so difficult to justify it. Sakura no hana is Japanese for cherry blossoms. And coincidentally, they are in full bloom these two weeks all over the world. If Seattle has Sakura trees, do visit them and enjoy their sheer beauty. They are pickled with salt and enjoyed throughout the year to make hot beverages, as tea substitutes. They can also be used in baking of course, which is what I’d used here. Likewise, shiro’an, made from lima beans, which is traditionally used in Japanese dessert (wagashi) making, can be incorporated as fillings to roll cakes. oh, maybe it’s another one off mistake like the one you mentioned on the SA bamboo matcha cake, so the only thing you enjoyed eating was the caramelised sugar? haha! poor thing! hahaha at least there was caramelised walnuts as the saving grace….